Explore the great outdoors in your very own luxurious camper. Addhire offers VW Camper vans for nationwide hire, we even hire out pet friendly campervans! Our daily rates start from as little as £75*. We also hire awnings to create greater use of space. 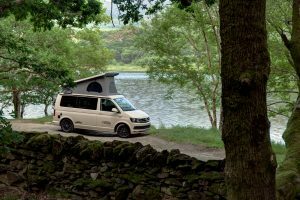 Our luxurious camper vans really have the home from home feel, just pack up and get ready to start your very own tailor made adventure! Our low season hire special offers start from 1 October until 31st March. Hire one of our VW Jobl campervans for just £75 a day inclusive of VAT and Insurance. There is a 3 night minimum hire. Contact us on 0151 350 6875 for more information. 50% upon booking & balance 6 weeks before hire. £750.00 (refunded once valeted and inspected usually within 24 hours). Payments need to be made by debit or credit card in the driver’s name. We can tailor a quote to include continental breakdown, insurance, green card and VE103 form. Photo licence, DVLA Code or NI Number and 2 x recent utility bills dated within the last 3 months. These are required to be shown at booking stage and again upon collection. 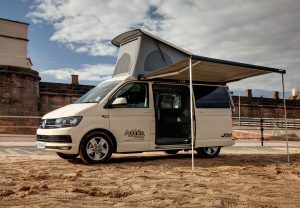 They are VW T6 Jöbl campervans equipped with wind out awning, cruise control, DAB radio, blue tooth, fridge, LPG gas hob and grill, kettle, cups, plates and cutlery, sink with hot/cold water supply, lift up roof, 2+2 berths (2nd berth occasional or children) 240v/12v electric supply, mains electric hook up facility, air conditioning, blown air heating and bike rack which will hold 2 bikes. The upper bunk is not suitable for children under 6 unless supervised.